Transcending above the standard rules of genre classification, Outlander has earned itself a remarkably large readership since the first novel debuted in 1991. Through her category-shattering novels, Diana Gabaldon’s series is a true contender in the literary world, having racked up over 25-million book sales before Starz ever unveiled the premiere television series at this year’s San Diego Comic-Con. To put that sales figure in perspective, the A Song of Ice and Fire series by George R.R. Martin had only sold 8.5 million copies by July 2011, two months after the initial airing of Game of Thrones on HBO. 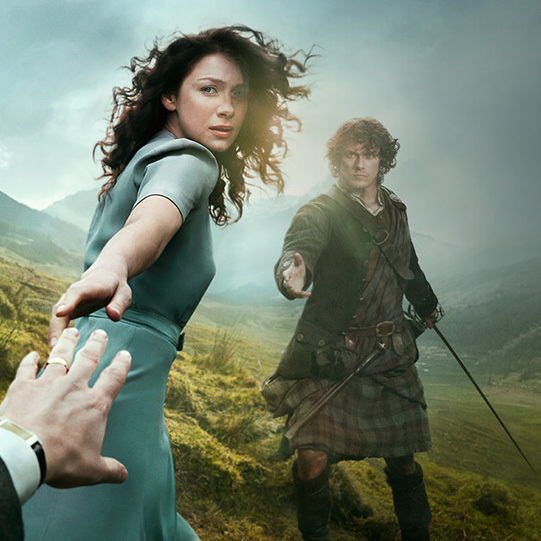 With elements of science fiction, fantasy, action, comedy, mystery and romance strewn throughout the pages, the genre flexibility is the reason the Outlander series has struck a chord with men and women young and old. With all its popularity and obvious profitability, the production of a filmed version of Outlander still saw years of hurdles attempting to have the books adapted into a feature length film, which eventually turned out for the best in the eyes of readers. A general consensus amongst fans had been reached that the novels should be adapted into a television program rather than a movie, so readers rejoiced when executive producer Ronald Moore (Battlestar Gallactica, Star Trek: First Contact, Mission: Impossible II) revealed that the books would become a series for Starz. And, considering that Gabaldon’s Outlander novels mostly hover around 1,000 pages each, even those who have never read the books can agree anything with that kind of epic length is simply not feasible as a single movie. Even a series of movies wouldn’t be able to properly convey the sheer epic nature of the books. Though some rigid fans of have spoken out against any changes presented by the show, they have so far proven to be a small minority. These alterations to the Outlander books should very well prove to help appeal to an even wider audience. As evidence in favor of this widespread audience draw is concerned, it speaks volumes that Starz has already ordered a second season (which will again, unfortunately, require a Starz subscription through local cable packages – such as DirecTV, Comcast, or others). Currently, there’s still no news on a UK air date for Outlander, however, the show didn’t start airing in the US until August, so it’s early days yet. Plus the second season pickup should make it an even more attractive offer to potential UK buyers. With the fact that there is an existing fan base of nearly 25 million readers, and audiences have only appreciated the presentation and casting thus far, there’s very little reason to believe Moore or Starz will attempt to take Outlander in any kind of outlandish direction, but only time will tell. ← First Look at Netflix’s Marco Polo!